Maybe your printer has eventually given up the ghost and it’s time to find a replacement or you simply feel like updating and want to be able to print via AirPrint and enjoy the current modern features offered by many of todays inkjet and laser printers. We have listed the following 5 printers we think are worth considering for use in the home or a small office and hope you find it useful and informative. 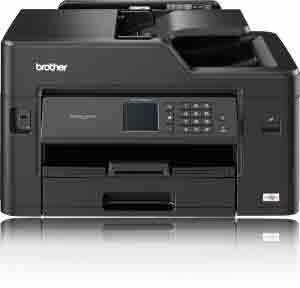 First impressions of the Brother MFC-J5330DW printer are likely to be ‘Wow! is this printer too big to fit in my home?’ The printer measures 304mm x 520mm x 400mm and is certainly larger than the average home printer but despite its size it’s not a heavy printer to move around. This Brother multi-function printer has the ability to print A4 and A3 paper, prints double sided and doubles as a scanner too. Brother are branding this as an A4 printer, not surprising as it can hold up to 250 A4 paper sheets in its tray at any one time. The A4 print speed is estimated at 22 pages per minutes for black and white print to 20 pages per minute for colour prints, the A3 print speed will obviously be slower than this. The running costs of the Brother MFC-J5330DW are an important factor as always and the best value inks are the high capacity compatible Brother LC3219XL ink cartridges. The black ink cartridge will print approximately 3000 pages and the LC3219XL Cyan/Magenta/Yellow inks will print approximately 1500 pages per colour. At just over €35 for a 4 pack of the compatible inks, this printer is especially affordable to run. 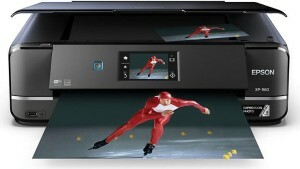 The overall performance of the printer is good with excellent quality photo prints. With this printer’s ability to print A4 or A3 pages at a reasonable print speed and would not look out of place in the home or small business. This All-in-One Epson Expression XP-960 multi-function printer from Epson has become a form favourite online. The ability to print A4 or A3 prints sets it apart from some of its Brother and HP counterparts using six ink cartridges for well defined high quality printing. The printer measures 148mm x 479mm x 356mm and is relatively light weight so easily unpacked and set up. This printer/scanner has touchscreen controls (large enough to make reading easy) with an SD card camera slot as well as the standard USB port. Blessed with wireless and cable connectivity it’s easy to set up on MAC and PC. The printer uses just one black ink among its six 24XL (T2431/2/3/4/5/6 colours) with a block buster 30 pack of compatible Epson 24XL inks for under €50! The ink cartridges are replaced individually as and when the printer indicates the need. Some key features of the XP-960 include the ability to print up to A3 size (ideal for borderless photo printing), sending prints via your mobile phone and an easy to navigate integrated touch screen. This small-in-one also has a scan facility with a top resolution of 4800ppi and is certainly good enough to cope with good quality photo scanning. It’s possible to scan to the desktop on your computer, a emery card in the printer or indeed to a cloud. Breaking the mould with this printer, Canon have designed the Pixma TR8550 printer primarily for the home office user as well as the home photo printer that they are equally highly regarded for. This printer operates using 5 x PGI-580XXL / CLI-581XXL ink cartridges and is considerably smaller in size than it’s Canon siblings aimed at the same home market. The printer will scan, copy, print and fax (does anyone still use fax?) and has an easy to use touchscreen interface. 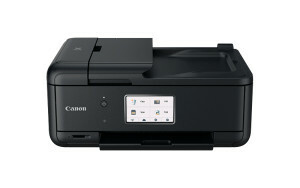 The Wi-fi is complemented with a bluetooth facility enabling connection of your mobile phone and print via the Canon mobile app. The printer also has a memory card slot so the connection to the home photo printer is maintained and the fact that there is an extra PGI-580XXL pigment black ink cartridge is a nod in recognition of this. The Pixma TR8550 printer has the ability to produce Duplex printing (that’s printing both sides at once) although this is limited to A4 size. The easy to follow touchscreen makes it easy to set up linking to your Wi-Fi via your password. Photo printing can be a little slow but the quality more than makes up for this. 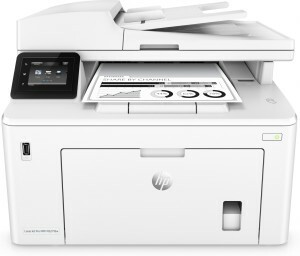 The HP Laserjet Pro MFP M227fdw multi-function laser printer with a Wi-Fi feature produces high quality black and white prints, single or double sided (duplex). This printer produces clean crisp black text and images and can be an economical printer to run if you decide to use the non original compatible brand. Let’s face it, the running costs of the printer is crucial – A4 Pages can be printed for as little as 1 cent per page if you go down the route of using a good quality compatible CF280X high capacity toner. The printer has 2 sheet feeds, the main feed holding up 250 A4 sheets with a secondary 15 sheet feed for heavier or specialised paper. Uncharacteristically, the HPLaserjet Pro MFP M227fdw uses separate drum unit and laser toner cartridges. In terms of speed, the M277fdw can print up to 26 pages per minute of text with a drop off of about 8 seconds for A4 coverage with images. Overall this printer is quiet, fast to use with a good quality scan facility and economical to run. Ideal for the small office and definitely worth buying if you are considering using the no-oriignal HP toners. 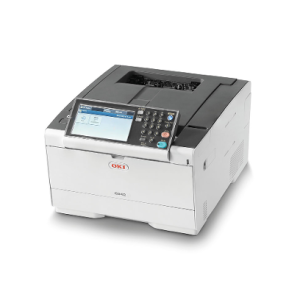 The OKI C542DN laser printer is an ideal 4 colour office printer. Easy to use and with a large colour touchscreen this A4 printer will hold up to 350 A4 sheets of paper so ideal for uninterrupted printing. This printer does what it says on the tin, prints only, no scan or Wi-Fi with this OKI C542DN printer. There is, however, the option for a Wi-Fi module should you desire.